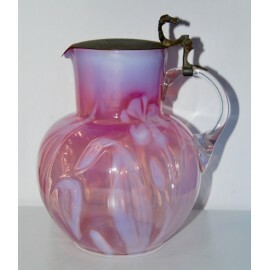 Blown glass jug of the early 20th century (1900-1920), pink and white tones, metal lid on top with engraved initials. DIMENSIONS: H. 22 x 18 x 15 cm. Antique blown glass jug of the early twentieth century (1900-1920), pink and white tones, metal lid on top with engraved initials. Very good condition, some oxidation points on the lid.